July has been going well, fitness-wise. Late in May, I joined a gym and started working out at lunch. My goal was to work out three or four days a week and be "active" on at least one other day. Most weeks, I get in my three, sometimes four. They don't always happen at the gym or during the lunch hour. Sometimes, if I'm not on baby-pickup duty, I will squeeze it in after work. Once in a while, I get to work from home and do it in the morning or mid-day. And sometimes, when the baby wakes up at an odd hour and I can't go back to sleep before I must wake for the day anyway, workouts have happened on my driveway in the dark. Along with trying to find balance, I've been able to try out more of the things that have come my way, as well. I took these Tiger Lady claws on a run recently. Pepper spray is kind of the normal thing to carry, but I'm always freaked out that I'll set if off accidentally, so these also give me some sense of security. When you clench your first, viola -- you are now Wolverine! 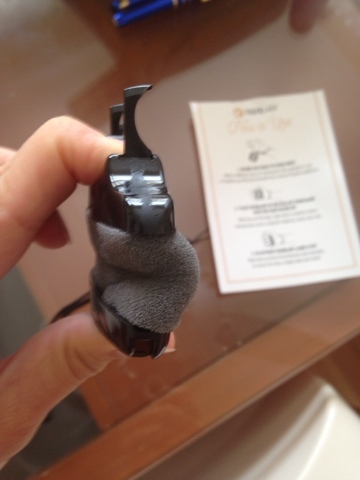 The claws can help collect DNA and come in a double-pack for runners. It takes some getting used to, but I think this could help some people. 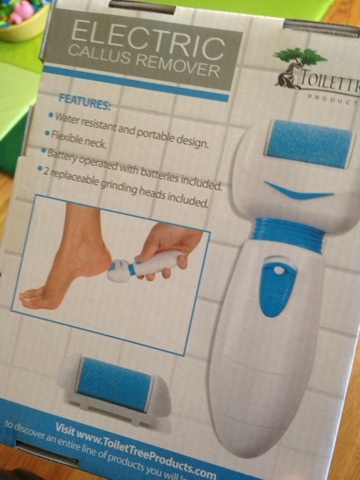 Also, I received this callus remover from ToiletTree Products and tried it out. I actually don't have a lot of problems with calluses (maybe because I'm not running enough yet! ), but I don't have time to take care of my feet these days, so this is a good little device for quick self-maintenance. Finally, with more activity comes more laundry. When both of us were to busy to work out for a while, laundry would take forever to pile up, and now, the poor washing machine is working double-time with baby clothes and our stuff. 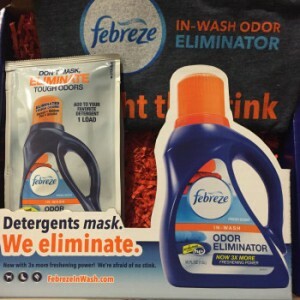 This Febreze In-Wash Odor Eliminator (coupon here) has proven to work on our workout clothes. We normally use detergent with Febreze already in it, but we have been using more "free" detergent for the baby and sometimes on our stuff, so this helps make up the difference. In other news, I was finally able to take a couple of days off to vacation with my family. It was all too short, as every other day in life is a whirlwind. I recently learned a hard lesson in "do-it-all-ism" -- I took the little one on a play-date and somehow left guilty that I was contracting out my baby puree making to Earth's Best instead of doing it myself. Yes, I could spend a little time on the weekend chopping, steaming, and blending, right? So I did this a few times, but Baby Tuesday has been clingy and fighting naps (and sleep), so I ended a weekend feeling like I had no rest, which is never good when every other day is just so much. My ability to parent is only as good as the amount of physical and mental rest I can get. Finally, with Baby Tuesday over 8 months old now, I have started worrying more and more about his first birthday festivities (whoa!). I have a niece whose birthday is the day before his, but I decided against doing a huge joint blowout since the last thing I want is for the little guy to be dragged out and around for his birthday. So we have decided to do something low-key at home just before Thanksgiving. Still, I find myself looking into decorations and stuff, and considering how long it takes me to get anything done these days, I need to get going. 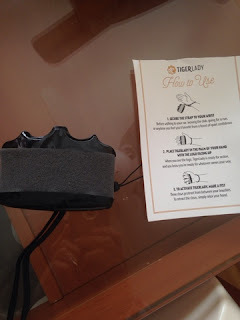 FTC Disclaimer: I was sent samples of Tiger Lady, Febreze, and ToiletTree Products and was not otherwise compensated to provide a positive review. 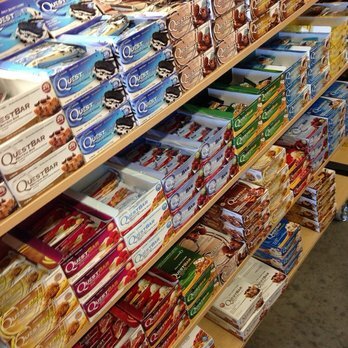 Quite a while back, I had reviewed Quest Nutrition Bars and had a somewhat lukewarm response to them. However, this was back when I would have chosen sugar over protein, and given my current goal to cut back on the sugary stuff where I can, these seemed to fit my needs and re-entered the picture. It started with an innocent need for food-on-the-run. Although I've gotten better at bringing food from home to work again, I usually eat more than I bring (darn breastfeeding appetite! ), so these keep me from having to buy extra food after I've spent my lunch breaks working out. To my astonishment, I actually liked the bar and decided to try all the flavors I could find. Luckily, GNC is really convenient to me, so with their Quest Bar promotion at the time, I was able to do just that. Cookies & Cream: This is the one that started my "Quest quest." I actually liked the faux-cookie bits inside. If I have to buy a box, I'd get this flavor. Double Chocolate Chunk: A very standard chocolate protein bar taste, though I did appreciate the chocolate chunks within. Chocolate Brownie: Also a pretty standard chocolate protein bar taste. White Chocolate Raspberry: Also has bits of stuff inside, definitely not exactly white chocolate (they are kind of crumbly), but not too bad. I'd eat this again. Cinnamon Roll Flavor: I had read some amazing reviews for this, but it wasn't really notable to me at all. Nothing about this reminded me of cinnamon roll. Coconut Cashew: I read a lot of good things about this flavor, but I did not like it at all. I think it needed more texture and didn't taste like either coconut OR cashew. Strawberry Cheesecake: I liked this! Although fruity bars don't usually sit well with me, I did like the little pieces of "cheesecake" that kind of reminds me of the cookies n cream one. Apple Pie: This was pretty good, with actual pieces of spongy dried apple inside. Vanilla Almond Crunch: Had bits of almond in it, kind of like almond meal, pretty good. Peanut Butter Supreme: Not bad, peanut-buttery for sure. This one has over 200 calories. Banana Nut Muffin: Definitely not a muffin due to the texture, but taste-wise, it was mild and not bad. Peanut Butter & Jelly: I think the allure of PB&J is mostly a texture thing, so in a sticky chewy bar form, I wasn't exactly thrilled with eating a peanut and fruit flavored bar. Mixed Berry Bliss: This was nothing notable, just a fruity chewy bar, slightly medicinal. Lemon Cream Pie: I'm not a fan of lemon desserts, so suffice to say this wasn't my favorite but it did have a flavor reminiscent of a lemon bar. Overall, there is just a small amount of "fake" taste (of proteins/sweeteners), which is a far cry from some other protein bars. Many are sweetened with monk fruit, which is the latest *thing* when it comes to sweeteners. For under/around 200 calories and 20-ish grams of protein per bar and very little carbs, these are definitely a good way to fuel up after a workout and makes you feel like you're eating a treat. To me, they are easier than taking in protein powder. FTC Disclaimer: I purchased these on my own and am providing an honest review. 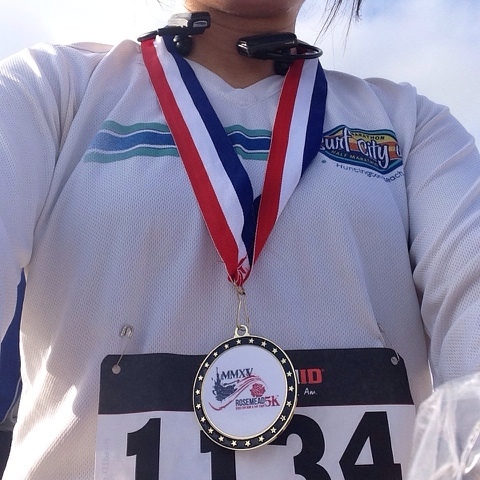 It had been well over a year since I really kind of run a race. I did a couple of others last year, but they were surrounding my pregnancy, so there was a lot of run/walking going on. So when I realized I was really going to be doing this 5k, I made sure to condition myself to be able to run without stopping. In the past, that was not notable, but I literally sat on my behind for three months after months of not running. 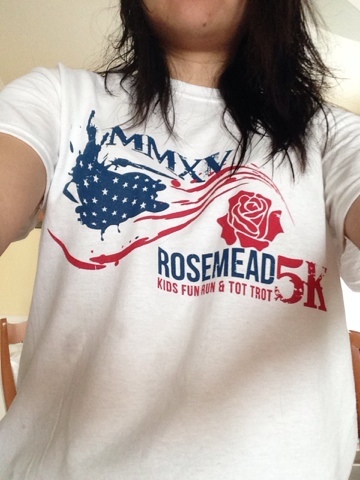 I ran 5k distances whenever I could -- a couple of times during my maternity leave around my house, and finally, last month when I joined the gym, I tried to do it at least once a week on the treadmill. Surprisingly, I was able to push myself on this fairly quickly, so by race day, I was confident I could do it. That morning, I was kicking myself because I reallllly did not want to get out of bed early. After all these months of not getting a full night's sleep, purposefully waking up early is super rough. Luckily, I had prepared everything the night before, so I just had to pump and get dressed. 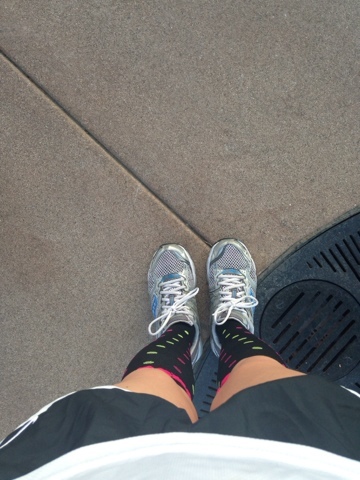 I wore these Lily Trotters compression socks as part of my outfit, which definitely heightened the mood. 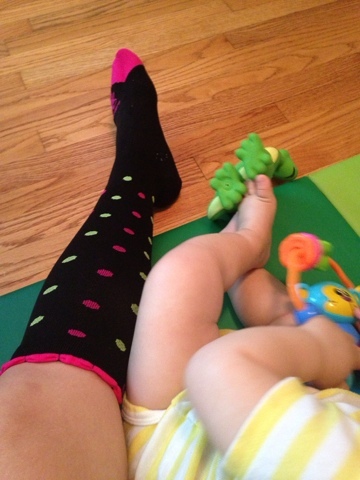 They are a designed compression sock line that is feminine. I could probably use some nicer shoes and a skort to match, but the little touch of fun to my running outfit definitely made the morning a bit easier. I decided not to run with a watch. I did have my phone with me (in a Ziploc baggie because it has been sooo long that I could not remember where I stored my running belt), but I decided to not turn on the GPS so that I would just focus on enjoying my pseudo-re-debut into racing. I started near the back with a friend and just kind of fell into a pace. I kept reminding myself not to push too hard, as it was muggy, had been recently ill, and I just wanted to enjoy. I felt pretty good throughout, but near the end, I could definitely feel that I had reached the point to which I had trained. I didn't know my time until I saw the printed results, but I saw 28-something on the main clock and felt pretty good about myself. I got my medal and found my good (and slightly politically incorrect) friend who said, "Not bad for someone who gave birth six months ago." I ran this race a bit harder two years ago (they didn't have it last year) about 3 minutes faster, so yes, there's a way for me to go, but I was just so happy to be there that there was no disappointment whatsoever. I rushed home to my baby boy. When I walked in, he smiled and when I walked off to watch my hands, he cried because he's reached a stage where he hates seeing me walk away. We plopped down and played per his usual. I think local 5k's and 10k's are probably about all I can handle at this point, and that doesn't bother me one bit. I'd like to run my 30th half-marathon at some point, as well, once I'm more well-rested and fitter. For now, I'm glad to have done something from my "old life" and look forward to running with the baby in the stroller in a few months... and eventually watching him do the tot trot at some of these races, too. FTC Disclaimer: I was provided a sample of Lily Trotters but was not otherwise compensated to provide a positive review.